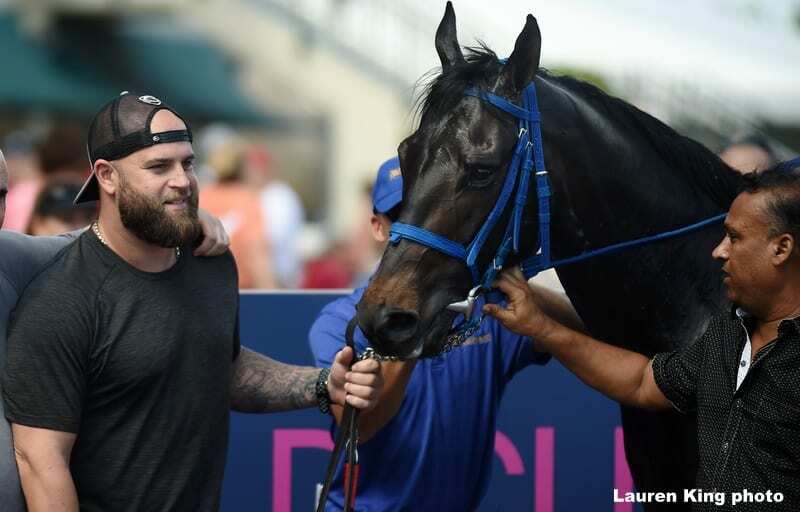 Former Major League Baseball star Mike Napoli celebrated his first win as a Thoroughbred owner Sunday at Gulfstream Park, visiting the winner's circle with Queen's Bird following the 3-year-old colt's victory in the fourth race. The Aubrey Maragh-trained Queen's Bird, who captured a $25,000 maiden claiming race by a length under Davie, FL native Tyler Gaffalione, was Napoli's second starter. Napoli played in three World Series while playing for the Texas Rangers, Cleveland Indians and Boston Red Sox. The 37-year-old veteran, who was a catcher, first baseman and a designated hitter, played on the Red Sox' 2013 World Championship team. This entry was posted in NL Article, People and tagged gulfstream park, Mike Napoli, Queen's Bird, thoroughbred owners, Thoroughbred Ownership by Press Release. Bookmark the permalink.